BERLIN (Reuters) - A leader of the far-right Alternative for Germany (AfD) party has poured cold water on plans by Steve Bannon, U.S. President Donald Trump's former political strategist, to forge a wide populist alliance to undermine the European Union. "We're not in America," Alexander Gauland, one of two co-leaders of the anti-immigrant party, told the Funke Mediengruppe newspaper chain in an interview published on Saturday. 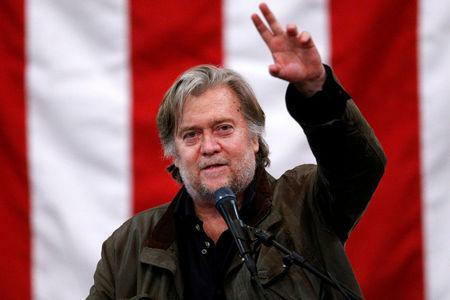 "The interests of the anti-establishment parties in Europe are quite divergent," he added in comments that amounted to a blunt rebuff to Bannon from one of Europe's most influential far-right parties. But Gauland said that while his co-leader Alice Weidel had met once with Bannon, he saw no possibility of cooperating with him. "Mr Bannon will not succeed in forging an alliance of the like-minded for the European elections." He said the AfD only had close contacts with Austria's far-right Freedom Party (FPO), junior party in Austria's coalition government. Former AfD leader Frauke Petry had always wanted to work with France's National Front, but that had not worked out. Raheem Kassam, a spokesman for The Movement, said of Gauland's comments: "The Movement is a clearing house of ideas, not a campaigning organization that would seek to have anything to do with AFD's national policy or election campaigns. We are content that senior AFD figures understand the project and are in touch with us every day. We look forward to working alongside those who want to do so, for the causes we all believe in."